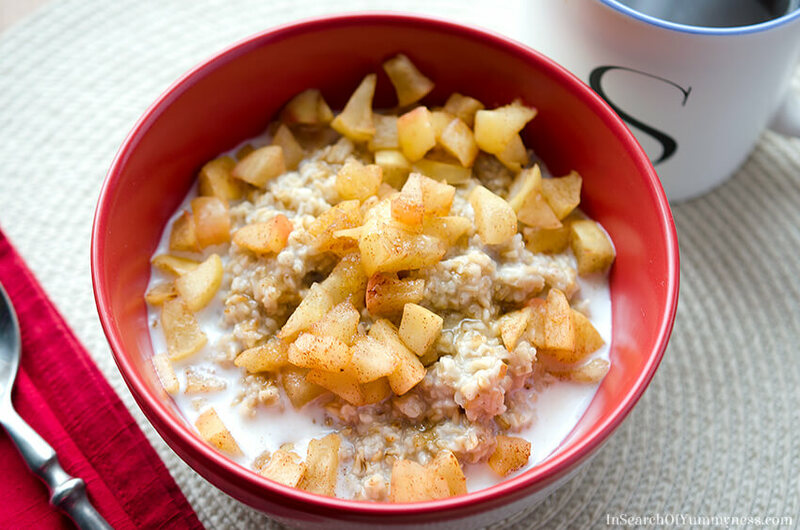 Apple cinnamon steel cut oatmeal is an easy healthy breakfast! This apple cinnamon steel cut oatmeal is what I’ve been eating for breakfast most days since finding out that I’ve got prediabetes. The soluble fibre in oatmeal is said to help control blood sugar levels and reduce cholesterol, so I’ve been trying to eat it on a regular basis. Anyhow, this breakfast fits into my new healthy eating goals so I’ve been eating it often. Eating oatmeal isn’t new to me – I’ve eating quick-cook rolled oats in my oatmeal for years. Lately I’ve been finding them less and less appetizing though, so I made the switch to steel cut oatmeal. The first box I bought was traditional steel cut oats that need to be cooked for ever. Ok, so maybe more like an hour, but still. Who has time for that in the morning?! I tried making a big batch of steel cut oatmeal in my slow cookers, and freezing portions to eat throughout the week. I must have done something wrong, because they were just gluey and disgusting. 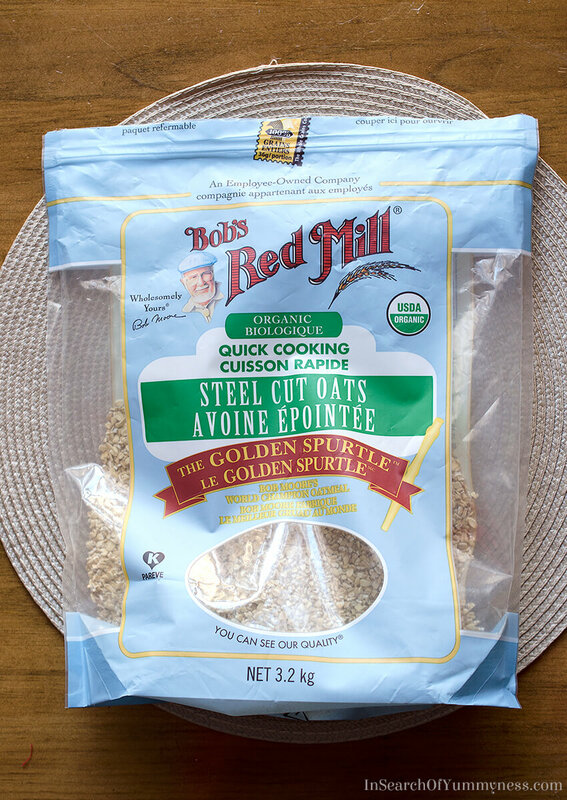 I finally found a happy medium between the speed of rolled oats and traditional steel cut oats in Bob’s Red Mill Quick Cooking Steel Cut Oats. I’m sharing the brand because I haven’t seen another brand quick-cooking steel cut oats, and I want you to be able to find this if you want to try it. This post isn’t sponsored. If you find the texture of cooked rolled oats to be a bit too mushy, you might enjoy the chewiness of steel cut oatmeal. I personally find it more interesting to eat. 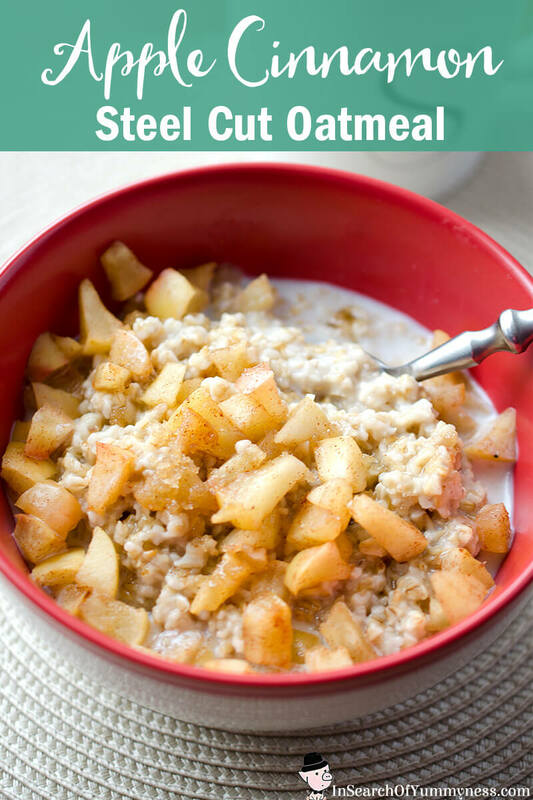 I haven’t found any information that says that steel cut is healthier than rolled oats, so I don’t know if there’s any health benefit to choosing one over the other. 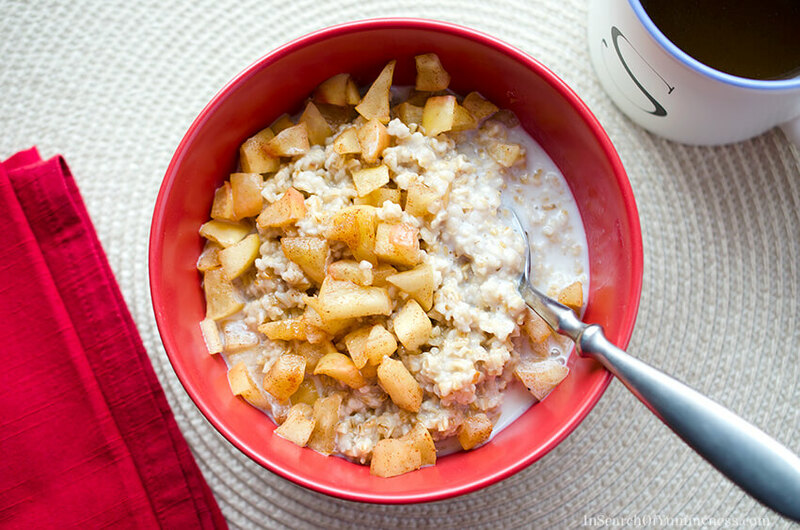 You could easily make this recipe with rolled oats if you wanted to – just cook it according to the package directions and follow the rest of the recipe for the apple cinnamon topping. Now, before anyone freaks out on me, I did add sugar as an option for this recipe despite the fact that I’m trying to reduce my sugar intake. My logic is that if someone is accustomed to eating flavoured instant oatmeal, they’re going to find that plain cooked oatmeal is really bland. A little bit of sugar can help make it tastier, and it’s far less than what you’d consume in the instant version. If you use a sweet apple like a Honeycrisp or a SweeTango apple, you may find that you don’t need the sugar at all. Adding a spoonful of peanut butter is also really tasty, and it adds some protein, too! The only topping I would warn against if you’re prediabetic, or just watching your sugar intake in general, is dried fruit. I recently found out that dried fruit is really high in sugar, so just be aware of that. If sugar isn’t an issue for you, have at it! Oatmeal is a source of soluble fibre, which may be beneficial to a prediabetic diet. Add steel cut oats to a dry pan over medium heat. Toast for 2-3 minutes, or until it smells a bit nutty. Add water and stir. Cook for 8-10 minutes, or until the oats are creamy. Meanwhile, in a bowl combine the apples and cinnamon. Microwave for 1 minute, stirring halfway through cooking time. Remove cooked oats from heat. 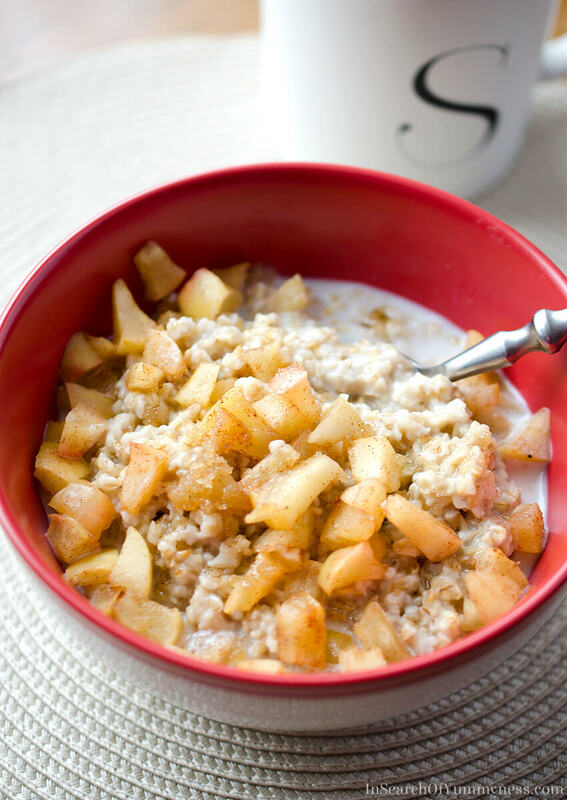 Divide oatmeal into 2 portions and serve in bowls topped with cooked apples, milk and sugar (if desired). In Search Of Yummy-ness provides content, except for comments (which the blog owner has no control over), for general informational purposes only. The content on this website is provided for informational purposes only, and is never intended to substitute for professional medical advice. Please seek professional medical advice before making changes to your diet or lifestyle. The blog owner and any contributors of this site are not responsible for adverse reactions or consequences resulting from the use of any content on this website. Thank you so much for this post and the information link about pre-diabetes. I, like you, was diagnosed recently, and have been looking for healthy alternatives for some of my favorite meals. Toasting the oats before cooking really did deepen the flavor, and I used a Pink Lady apple – it turned out delicious! Thank you again! Hi Tanya, I’m glad you found the information useful and that the recipe turned out well! Are there any recipes that you are looking for in particular? Let me know and I’ll try to help!